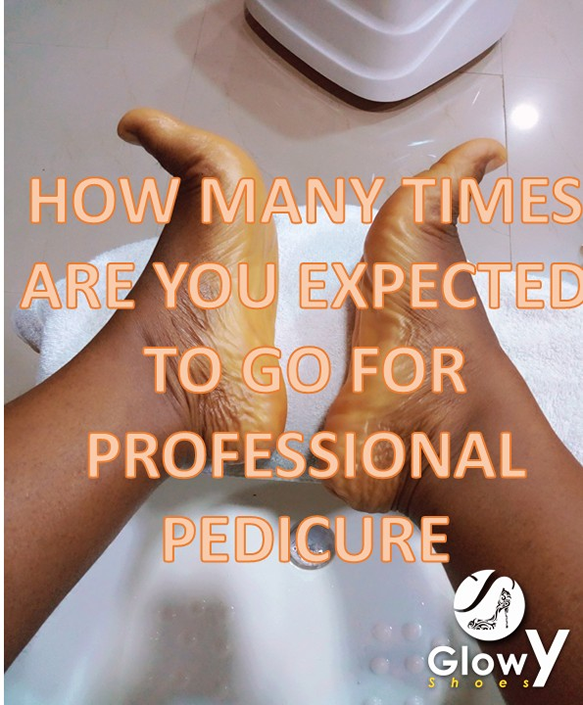 Glowy: Question of The Day: How Many Times Are You Expected To Go For Professional Pedicure? Question of The Day: How Many Times Are You Expected To Go For Professional Pedicure? So I recently went for my usual pedicure at the spa and the usual me will be all quiet all through save for my interaction with my novel but I decided to have a little chitchat with the pedicurist. In the course of our discussion, I asked her the above topic question so as to hear her opinion on the subject matter, though her response was personalized to my feet with her saying I should get my Pedi’s done twice a month due to the fact that I have a very soft and neat foot unlike some of her customers whose feet are hard and coarse and will need at least 3-4 Pedi sessions a month. In a layman’s English, what she meant was that your feet type will determine the no of times you need to have a professional pedicure. Personally I’m obsessed and a sucker for clean feet and most times consciously or unconsciously , my eyes tend to drift first to one’s feet and with that I know where to place or rate you hygienically. Truth be told you don’t even have to go the Pedi parlor/salon to get your Pedi’s done cause with the right types of brushes, you can have a clean feet in the comfort of your home or for example you can dedicate a day just to have the time to soak in those feet in warm water and sea salts which is also cool. I actually do that at home most times with my mom and sisters and then everyone takes turn to scrub each other’s feet even if you don’t have anyone to do it for you, you can sit and get scrubbing all by yourself it’s not that hard. I understand that most times we love and enjoy the feeling of getting them feet pampered and no one understand that language more than I do but if you would have to be going say thrice a month for a professional pedicure session, it could cost a fortune most especially if you on a budget or if it’s a high brow salon but if you don’t seem to mind, oh please ride on with the pampering. In conclusion, the texture of your feet should determine your frequency to the pedicure salon or your finance should also be a determinate but in all you are free to go as many times as you want especially if harsh chemicals are not been used. NEVER USE RAZOR BLADES: You should never use razor blade in scrubbing out the dead skin from your feet cause in doing so, you are only giving room for more hardened skin to grow because after few days post pedicure, the skin underneath the foot will become coarse. The easiest way is most times not the best way. WASH YOUR FEET REGULARLY: Always learn to wash your feet when you come back home from work. I understand how tired and worn out you may be after you get back but just try to at least wash your feet even if you won’t have the strength to have a bath before going to bed. This act helps in maintaining a clean feet at all times and it helps you sleep better. LEARN THE ART OF SOCKS WEARING: Wearing of socks is very essential for keeping a neat feet. Making it a part of your lifestyle will down your trips to the Pedi salon and by that I mean e.g. if you have your Pedi’s done today, and you practice the washing and slightly scrubbing of your feet after a day’s job then put on socks, trust me your trips to the salon will be cut from twice in a month to once in a month and to even once in two month so you see you’ve saved yourself some bucks. MOISTURIZE: Always moisturize your feet after every wash with good moisturizing cream and if you can’t lay your hands on any, make do with petroleum jelly, shea butter or better still perfumed oil. I always wash my feet before I go to bed but it sounds like I need to put lotion on it and wear socks too! Thanks for these tips! Yes you should cause feet care is very important... On moisturizing, You not the only one that forgets dear, I know lots of people that do too but its very essentially for keeping the feet soft. I also love keeping my feet in check and super clean. I just need to moisturize them more. Thanks for these tips! I need to try the sock trick! You really should.... Thanks for reading. Oh yes, definitely, first thing I do on getting home is to wash my feet. Especially on days where I've worn exposed shoes. Caring fr one's feet sure is essential. That's the way forward girl. Spot on... Our feet needs all the love and care it can get..
Great tips Glory, thanks for sharing! I always wash and moisturize my feet before going to bed :) Nice tips <3 Great post! Hugs! That's the way to go dear.. Thanks for stopping by. Pampering our feet is the best food you can give it... Thanks for stopping by dear.